Sparky the dog in 'Frankenweenie'. This clever little film is a throwback in more ways than one. Not only is it an obvious homage to the monster movies of the past, like Frankenstein, Godzilla, The Mummy and more, but its style of animation also hearkens back to a time before 3-D computer graphics. These aspects, combined with a stellar cast, great script and smart comedy, make Frankenweenie one of the better films of the year. Victor Frankenstein (voiced by Charlie Tahan) is a reclusive boy who loves two things: making amateur monster movies and his dog, Sparky. In fact, he combines the two, with Sparky cast as the hero who saves the miniature town from invading creatures. Sadly, one day Sparky is killed by a motorist, leaving Victor to grieve until his teacher, Mr. Rzykruski (voiced by Martin Landau), gives him the idea of resurrecting Sparky using electricity. The experiment is a success, and Sparky lives again, but keeping him secret might be too hard for Victor, especially when Sparky likes to leave the attic and show himself off to the town. Almost every aspect of the film is on point. The characters are all adorable and/or purposefully archetypal to achieve specific gags. Consider the creepy hunchbacked kid who wants to be Victor’s assistant; his name is Edgar ‘E’ Gore (voiced by Atticus Shaffer). There’s also a token Japanese kid named Toshiaki (voiced by James Hiroyuki Liao), who happens to unleash a Godzilla-like monster unto the town. Then, of course, there’s Mr. Rzykruski, who is the splitting image of Vincent Price. The characters all fit together nicely with the general atmosphere of Frankenweenie to create a weird little town comprising young versions of iconic movie monster clichés. 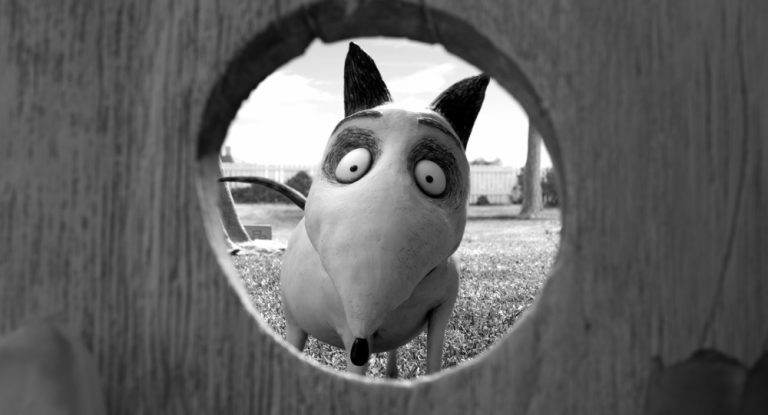 Of course the real reason to watch Frankenweenie is for the relationship between Victor and Sparky. Seeing their interactions and all of the emotions that spring forth from these expressive characters will warm hearts in good times and wet cheeks in bad. It goes without saying that dog owners – especially those that have lost a pet – will find special kinship in this story. The soundtrack is particularly good in Frankenweenie and this is some of Danny Elfman’s best work. While music is sometimes credited as making up 50% of the enjoyment of a film, here the music carries a much larger load, especially during the lengthy scenes that have no dialogue. At times, movie soundtracks can feel intrusive, acting as a crutch for filmmakers who couldn’t cross the emotional threshold with the visuals. By its design, Frankenweenie requires a solid soundtrack, and it’s a boon to audiences that a master craftsman like Elfman provided the score. The animation is superb throughout. In fact, it’s so good that audiences will sometimes forget that they’re watching stop-motion animation. Attention to little details, like areas on a living room carpet that have been disturbed, did not go unchecked. Even seemingly impossible effects, like water leaks springing from Sparky’s reanimated body, were achieved here. The only times the animation is detectable is when Mr. Rzykruski speaks. There don’t appear to be any frames of animation between the extremes of his mouth movements. It doesn’t look bad, but it’s noticeable. On the other hand, it does give the character an unnatural feel, which lends itself well to his persona. Nevertheless, it makes one wonder why stop-motion was chosen in the first place instead of 3-D animation except as an artistic challenge. Overall, the script is fantastic and delivers everything an audience would expect from this movie plus a few unexpected comedic touches. Consider a pet cemetery with clever phrases chiseled into headstones, like “Goodbye Kitty” instead of Sanrio’s ubiquitous Hello Kitty. At times, however, the script does feel inconsistent in its logic. For example, when Victor’s experiment is recreated with a fish, for some reason, the fish turns invisible and then physically disappears entirely. Why would that happen? Later, with mad science run amok and reanimated creatures invading the town, the heroes are able to deal with the attackers using the same method that brought them back to life with no explanation as to why that would work. Ultimately, however, these complaints are minor at best and there won’t be too much love loss from audiences because of them. While Frankenweenie is a wonderful steward of audiences’ emotions, gently and naturally drawing viewers to the farthest edges of catharsis as needed, the ending will feel like it’s pandering to moviegoers. It’s almost as if the filmmakers didn’t know how to end the film. Since Sparky is a creature that has come back from the dead, one of the plots of the film is whether or not he will return to the dead, especially since the townsfolk consider him an unnatural abomination. How this dilemma is ultimately resolved may leave audiences a little dissatisfied in that the film purposefully yanks viewers from one emotional extreme to the other several times in just a few moments. Ultimately, Frankenweenie is a great choice for families who want to enjoy a wonderfully crafted film that all ages can appreciate. The young ones will love the eccentric characters, the not-too-scary action and, of course, the ever adorable Sparky. Older audiences will enjoy the overall cleverness of the film. This ability to please the crowd is Frankenweenie’s greatest feat; it’s a film that appeals to families without necessarily being a family movie.